Super Eagles head coach Gernot Rohr has confirmed that FC Midtjyland striker Paul Onuachu and Brighton defender Leon Balogun will start when Nigeria face Egypt in a friendly match on Tuesday. Nigeria will face the 2019 Africa Cup of Nations (AFCON) hosts at the Stephen Keshi Stadium, Asaba four days after wrapping up their qualification series with a 3-1 win over Seychelles on the same turf. 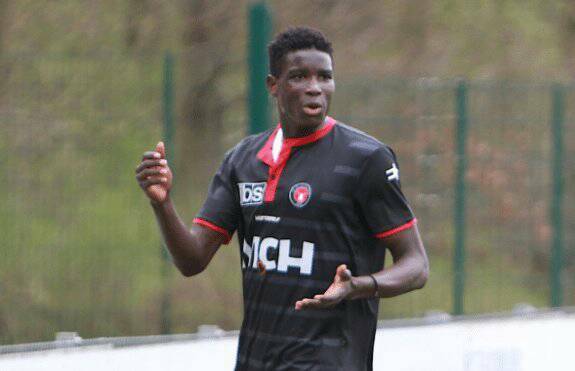 Both Onuachu and Balogun started the game on the bench with the former coming on as a second half substitute for his senior team debut. Rohr however confirmed in a press conference on Monday that both will play from the start. “We have a new striker starting. We will have a new goalkeeper playing and there will be a change in defence, Leon Balogun will play and we will also have a new midfielder in the midfield,” Rohr told journalists. With four players from the Super Eagles; Francis Uzoho, Chidozie Awaziem, Valentine Ozornwafor and Victor Osimhen assigned to a rescue mission with the Under 23s on Monday, Rohr hinted further that some of the other fringe players will get minutes on Tuesday. “We have the young player Udo (Ikouwem) who I saw at the Under 20, we also have Effiong (Ndifreke) here so we will be able to make six changes since it is a friendly and see a lot of players,” added Rohr. Nigeria and Egypt (two of the twenty-four qualified teams for the AFCON) will face on Tuesday starting from 5pm Nigerian time (subject to further confirmation).